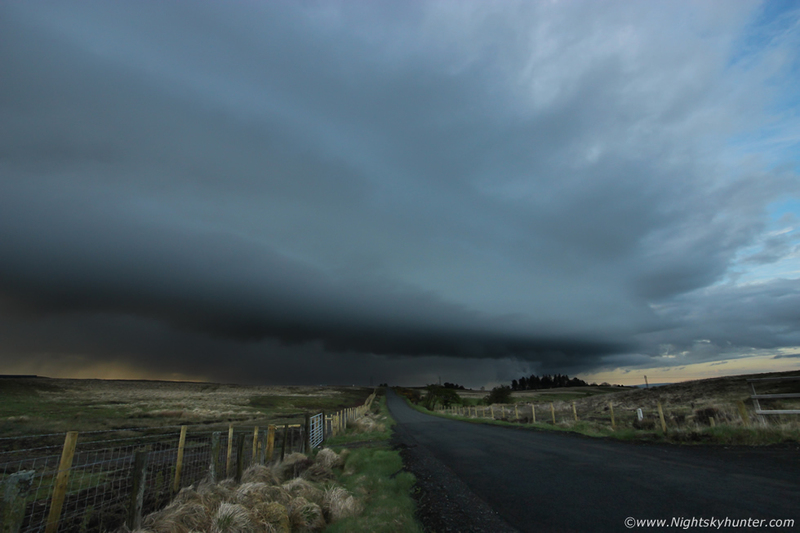 2018 sure has been a quite season to date for thunderstorms, in fact, prior to this event I have only experienced one thunderstorm this year which passed over Maghera a couple of weeks ago, it was a real treat to hear six good rumbles of thunder to break in the chase season, however the storm itself was high based and offered no structure at all, that being said it was well received and announced that the new convective season was underway. The atmosphere then showed signs of potential brewing on the charts for Saturday May 12th, this was spotted on GFS almost a week in advance however at that range we fully expected the instability to downgrade closer to the time, however by Friday the 11th it was not only still showing but had actually upgraded showing the best CAPE of the season so far, all eyes were so focused on the following day that we all had forgot about this day, May 11th. No convective forecast had been issued however an active cold front was crossing the country bringing a big drop in temperatures and widespread heavy rain, it was a rotten damp day for everyone however by the afternoon things became interesting. A squall line had formed along the cold front across mid Ulster showing broken line segments, these are areas were strong winds and even brief tornadoes can spin up within the line. 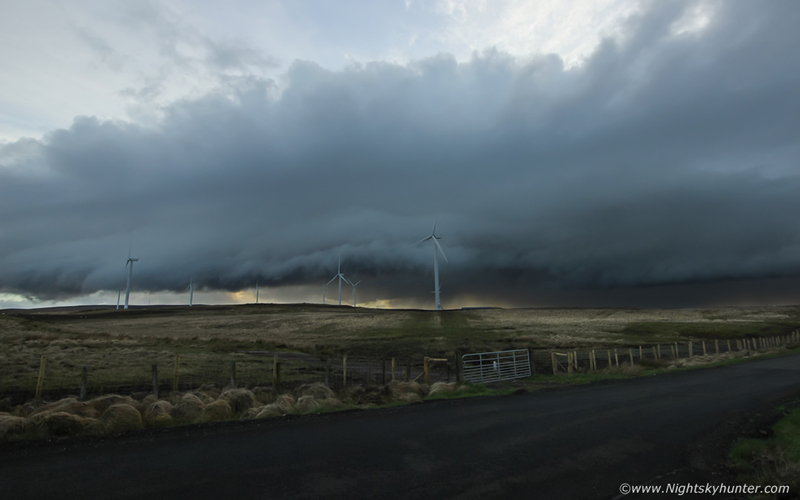 John Fagan reported significant rotation over his home in Dungannon which was confirmed up by Philip Blackstock who also observed the rotation event from another location in Co. Tyrone. The convective maps revealed very strong vertical wind shear across the country with tornado parameters and convergence, the rotation observed was likely caused by some or all of these factors. The early evening was beautiful in comparison to earlier, the front had passed through leaving behind a clear and blue post-frontal air mass with bright sunshine. The atmosphere was still slightly unstable and highly sheared however the lifted index was positive, I expected no storms from this set-up as the instability was too marginal, that being said well scattered heavy showers where forming on radar below the border and moving NE on the SWy flow however at the time they seemed far away and not worthy of watching, or so I thought, so I forgot about all things storm related and lay down on my bed for a while, I picked up my TORRO book which I had been reading for the second time and began delving into UK tornado synoptic set-ups, after 30 min's I set the book down and briefly dosed off into a cat nap. I suddenly woke at 20.00 and felt compelled to check facebook chat, when I did I was shocked, a quick glance revealed that there was a storm in the area, Conor McDonald had an image posted of a large cell captured from outside Maghera with big dark updraughts off in the distance, the updraught region seemed large, Paul Martin posted that he could see the same storm from Omagh, it was currently located to the W of Dungiven and was producing thunder and lightning. I was in total shock, how could this happen?, I ran across to the W facing upstairs window and looked out, there was the storm perched over the mountains with dark updraughts sheared downrange all across the skyline and surrounded by clear air, I checked radar, the cell had a red core and was slowly moving NE, if I went to Glenshane I would be behind it, however it would already be moving away from me and I couldn't chase it NE with that road network, I decided I would try to get ahead of it and stay on this side (E) of the storm and try to get a decent view before it vanished, I knew this was going to be a race against time, I jumped in the van and raced out the Coleraine Road. Following my instincts I just kept going N until I got ahead of it's trek then decided to get closer, I took the only good W option I knew which was on the way into Swatragh, past the old church, and drove up to high ground as fast and safely as I could to get away from trees in the hope of getting a good view, I was not disappointed, once I passed a clump of bushes and rounded a corner there was my storm in plain sight, I was expecting to see a loose decaying mess of cloud, but instead I was surprised and delighted to see a structured thunderstorm perched over the hills, I pulled over and quickly got out with the camera. It was 20.20 and here was an entirely unexpected storm showing off in the late evening light before sunset, the cell sported a huge shelf cloud spanning the entire skyline, I was definitely not expecting this at all, I fired off several images, all of these are with the Samyang 10mm F/2.8, this was huge, this image shows the centre and W side of the shelf. 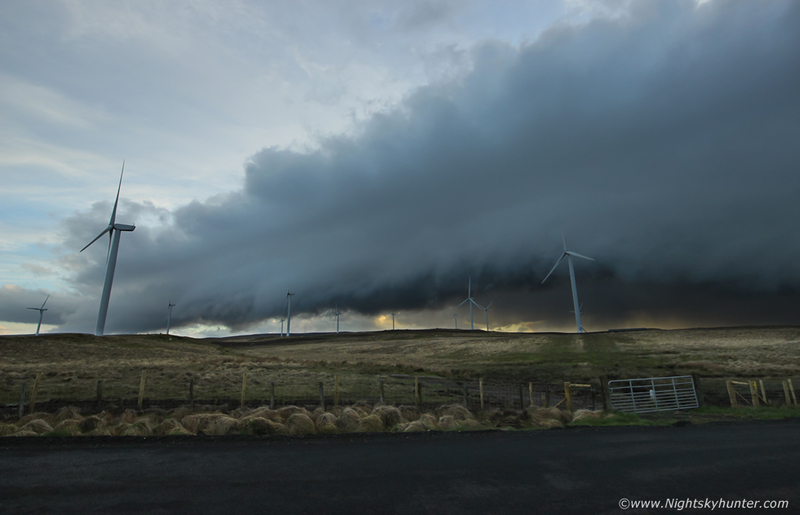 Panning to my right to take in the E side of the shelf, the structure made for a dramatic sight as it approached the wind turbines, the clouds darkened the sky so I had to increase the ISO to 400 for hand held shots, there was no time to mess around with a tripod as the shelf was surging towards me, compare the location and size of the shelf between these first two images, that's how quickly it was moving. The precip core was dark and back-lit by the sun, the skyline behind the core was vivid orange-yellow to the naked eye which contrasted beautifully with the blue steal storm clouds. Panning quickly across to the W (L) once more, this was my favourite scene of the event, those mean storm clouds low on the hills making a beeline for the turbines which provided a great sense of scale. I really wanted to shoot a DSLR time lapse however there just wasn't enough time as the shelf was already on me and the rapidly changing light and angle and hence camera settings changing wasn't suitable for a proper time lapse sequence, however I wasn't annoyed in the slightest, this was an absolute treat, with the exception of one passing car I had the entire storm to myself, surrounded by open countryside and accompanied by the sound of sheep as this beast dominated the late evening skyline, to me this was Heaven. Once a storm has passed it's mature stage it will become outflow dominant. 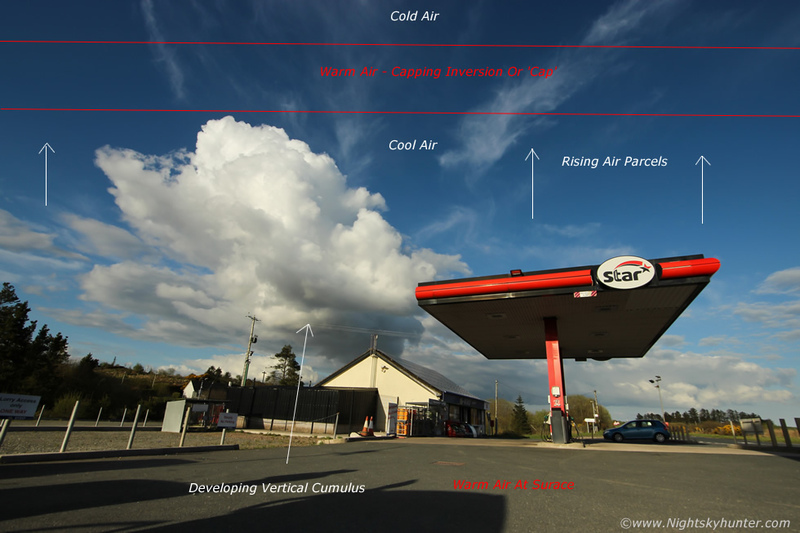 Outflow is the term given to rain cooled air, the storm is no longer a mature inflow/outflow balanced entity but instead is entirely in outflow mode. When this happens cool descending air is blown forward and down from the storm's core in an invisible pan cake called a gust front. 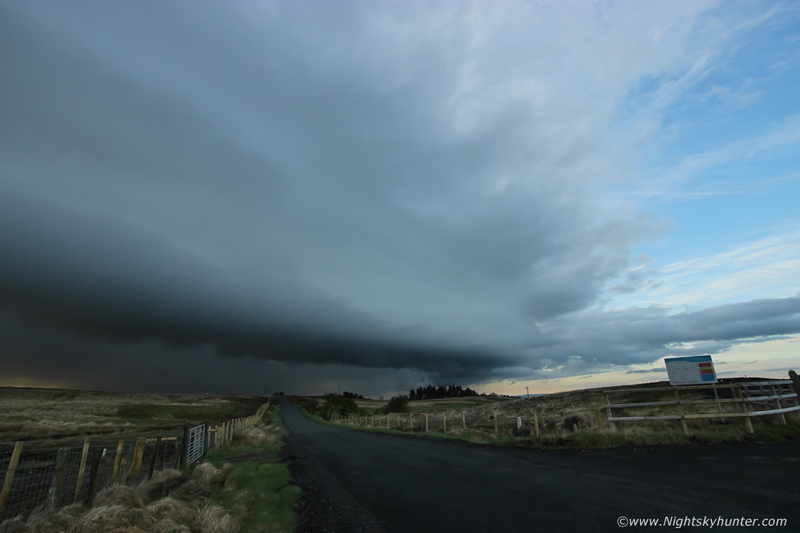 The gust front spreads across the ground lifting moist stable air which then condenses into a large linear cloud feature called a shelf cloud. Shelf clouds vary dramatically in appearance but more often than not they tend to look mean and dramatic. Such features are a visual sign of forced linear convection, on rare occasions in severe set-ups brief tornado spin ups and gustandoes can form under a shelf, however more often than not a shelf cloud is a warning of a large drop in temperature and the onslaught of heavy rain or hail with or without thunder/lightning. The wind from such features tends to be strong and of a squally nature, in strong storms these straight line winds can cause damage comparable to EF1 or EF2 tornadoes. Looking back to the W as the leading edge of the shelf approached the turbines, as you can see there's no precipitation under the shelf on this side as the storm was now on a downward trend, the unstable air was rapidly turning stable and the solar heating which fueled this cell was now waning, still it made for an impressive skyscape, I just wished I had closed my van door, but in the excitement of the moment I never thought. Last image from the chase as the storm overtook me sporting subtle whale's mouth on the far end, the dark clouds passed over then broke apart and the sunset glow reappeared over the hills as if nothing had happened, it felt like a stealth storm event, as I stood here I still couldn't believe I had intercepted this sudden storm, it just goes to show that CAPE isn't everything, good lift with convergence and shear really are the key factors which can compensate for a lack of strong instability, thanks to the guys for posting the heads up on chat, otherwise I would never have seen this storm. After this I drove back down the mountain and topped up the van with diesel for tomorrow's storm chase. Saturday looked to be the main event of the season to date with 400-500 CAPE, LIs of -2, upper air temps of -30C, a mid level trough moving in from the W and strong solar heating all day with decent moisture on a SWly flow. The set-up actually upgraded by late morning with charts showing enough wind shear for multicell storms, the excitement level was high, I was psyched up for a good chase and my expectations were high after last night's shelf cloud catch, it could only get better this day with greater energy. The target area ran from Armagh into Dungannon and along the W side of Lough Neagh, however initiation could be late in the day so it would be one of those days of sitting in the house and watching radar for developments. 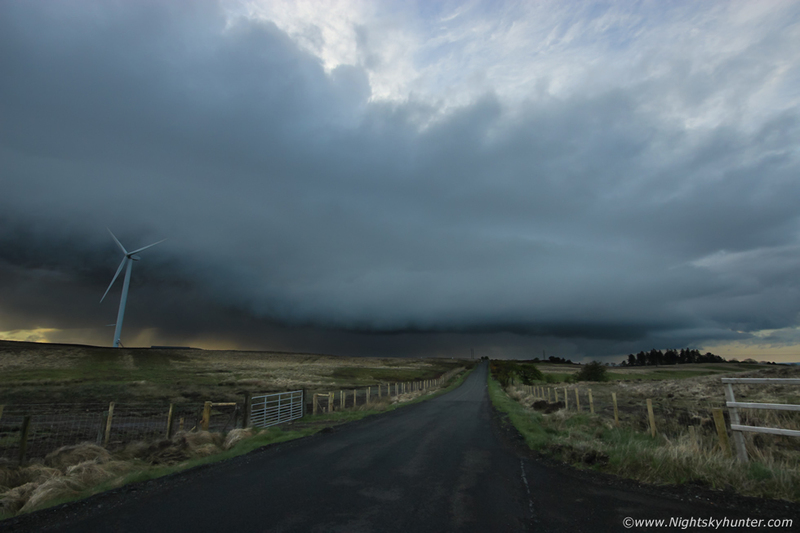 On facebook I chatted about the set-up with John Fagan, Conor McDonald and Paul Martin, we were all keen on chasing and the discussion became quite involved, I honestly don't know as many other N. Ireland chasers who are as passionate about thunderstorms as we are, and that's being modest. During the discussion we sampled a selection of Skew-T soundings, and this was when a red flag was raised, all soundings indicated cap concerns however the sounding for mid-Ulster in particular was awful showing a warm nose at 500MB which extended well into the atmosphere, this was a strong capping inversion, however we were all so optimistic we assumed it might well break late in the day, after all, we had good solar heating and a mid level trough providing lift. 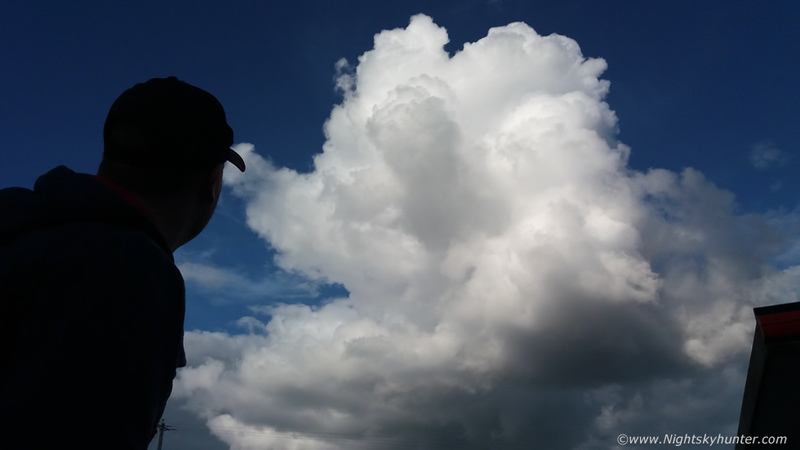 We waited and waited, nothing, blue skies and a few harmless cumulus clouds, the cap held the entire afternoon and things were not looking good at all. A storm fired over Dublin (urban heat island) however N. Ireland was bone dry. By 18.00 it was still bone dry and it looked game over, we spotted a few showers approaching the border on radar which seemed to be growing, could these move N and pop up?, there was a chance, I relocated to Cookstown, resumed communications, John, Paul and I where all in the Tyrone area and we decided to meet and by late evening we all met up at a filling station on the Omagh road. 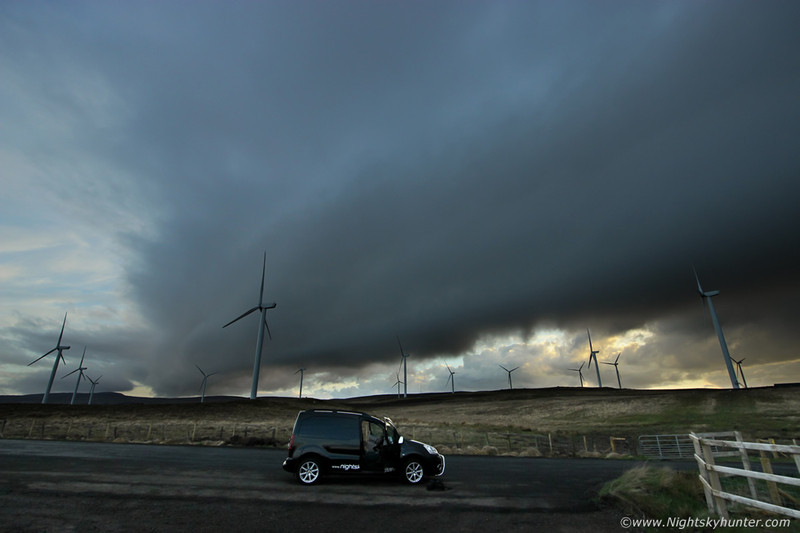 This was N. Ireland's version of chaser convergence, three vehicles beside each other with owners staring up at the sky pointing while the sun shone, I felt sure we had to be the only three people in the country watching the clouds and hoping for a storm, some things never change. We spotted a cell below the border which we could see visually with an anvil sporting sinking mammatus but it didn't even produce a spark. We watched convection struggle against the cap, this is an annotated image showing the scene, this nice updraught was building vertically and exhibiting rapid motion however we could clearly see it's top hitting the invisible cap and folding over, it tried so hard to be a cell however it wasn't to be. I set up the DSLR and shot a time lapse of this tower trying to break the strong cap just to get something from this day. Even though it was a frustrating day it was still great to meet up with the guys and watch convection bubble up on a sunny evening and chat about all things storms related. Today was a lesson on capping inversions and a sign from nature to pay more attention to Skew-Ts, anytime I learn something new or get educated by nature is always a success in my books, these experiences help refine future forecasts and chases, the big storms will come, and when they do we will be ready for them, thanks for reading.